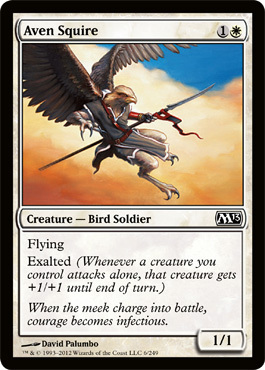 Aven Squire – This is a card that you need to have multiples of if you are drafting the White/Black or White/Blue fliers deck. Its a simple card that has a lot of angle to it by letting one of your guys get bigger or just swinging over the top itself. Griffin Protector – A simple design but a complete house from what I have seen so far. 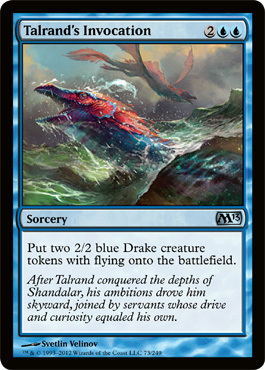 My favorite is playing Krenko’s Command or Talrand’s Invocation, attacking with some other exalted triggers for a lot of damage. Talrand’s Invocation – I think the cat is out of the bag already for this one but if you dont know, take this high. I had someone tell me they take this card over Murder. I dont know if I actually agree but I can see the argument. 2 fliers for 1 card is a beating and if you are lucky enough to have an Archaeomancer as well….then good for you. Tricks of the Trade – Shortening a damage race or just breaking open a stale board is worth the 4 mana you have to play for this card. This card is not a super high pick but in the right deck its absurd. Cower in Fear – I like this card against the exalted deck mainly but it can be good against mirror decks as well. It may not always be a main deck able card, but it can blow out the right deck. Mark of the Vampire – A super sleeper that I see people not even playing sometime! 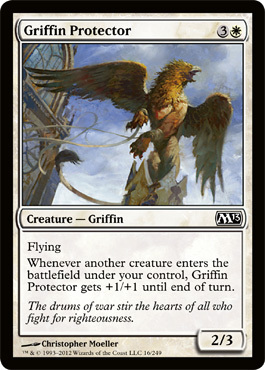 This card is insane on any creature and has the ability to shut out an opponent just with the life gain. I like it on anything with evasion but again, if you can win with it, don’t be picky. Veilborn Ghoul – This card cannot block but in most decks you dont need to. I like being able to re-use a threat with no real draw back. The swamp tutor lets you get him back a few times while bringing in the beats. Try this guy out in an exalted deck, you wont be disappointed. 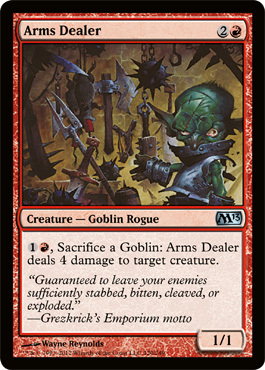 Arms Dealer – This is another I don’t think people were giving credit to int he beginning but a GP was just won off the back of this guy so I imagine I wont be seeing any of these anymore unless I open one. Even paying 5 mana to kill almost everything relevant is worth it but also using Krenko’s Command to make Flame Slash spells is just a nail int he coffin. 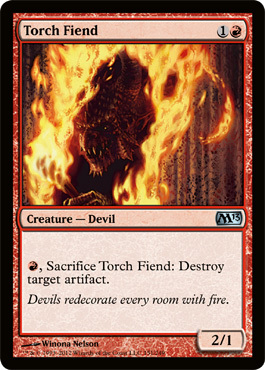 Torch Fiend – This guy got upgraded to Uncommon and I was wondering why he wasn’t there in the first place. In M13 where Ring’s are everywhere as well as busted Artifact Rare’s, he is very handy. He can always trade up with a few cards as well for some minor advantage. Bond Beetle – This guy is not super insane on its own but it is like a swiss army knife. 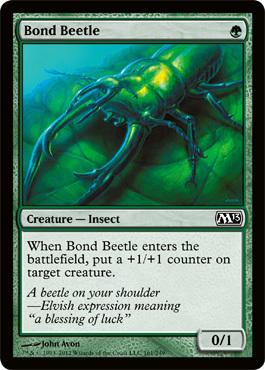 Roaring Primadox and Bond Beetle are best friends to say the least. He is also good with any card that has evasion or cards that are starring at each other on a mirrored board to help break it open. 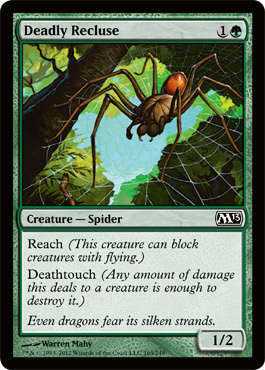 Deadly Recluse – While not being a huge beast, this little guy can trade with a Serra Angel or any other large creature for that matter. He is simple but gets the job done. 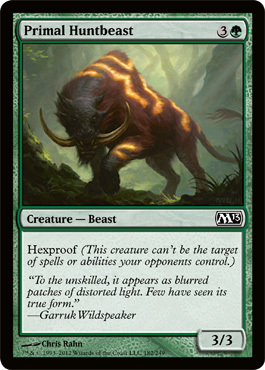 Primal Huntbeast – I might like this guy more than most, but my reasoning is that this card is common and it doesn’t die to basic removal. Feel free to slap on a Ring or a large pump enchantment and get ready to either bring the beats or trade your guy for their whole team. 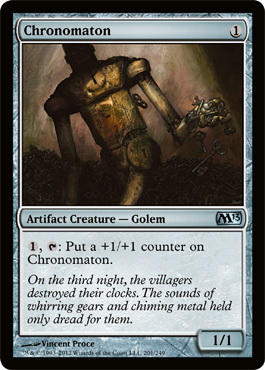 Chronomaton – This is the Little Engine that could. He starts small but gradually gets out of reach for any opponent if untouched. This is another card that is not a super high pick but easily goes into any deck and gradually becomes a threat. 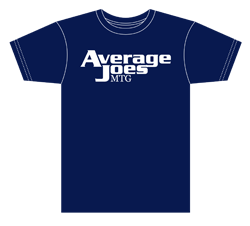 I hope this helps some of you to make some better choices when drafting. 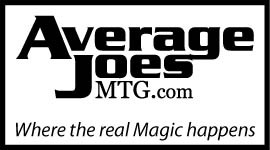 It can also make the difference when choosing cards for a sealed pool Let me know if I missed a card you think should have made it in the comments.